I just listened to this Tuesday's edition of the Skirted Roundtable (http://www.theskirtedroundtable.blogspot.com/) and the discussion on paint. In my design business this is absolutely one of the biggest questions I get, so I thought I would expand on the discussion and offer some of my experiences with paint and discuss some common paint concerns. As Megan says, paint gives a lot of decorating bang for the buck and is easier to undo than any other decorating decision. But, interestingly enough, in my experience, it is the one thing people seem to be the most afraid of. Maybe because it often covers large amounts of space, it seems overwhelming and too permanent, but it definitely isn't. Colors evoke feelings and emotions. Look at your space and really think about the role the room plays in your life. What parts of the day do you spend the most time in the room. Maybe you want a more energizing color in a room where you spend more waking hours and peaceful, soothing colors where you spend time winding down in the evening. 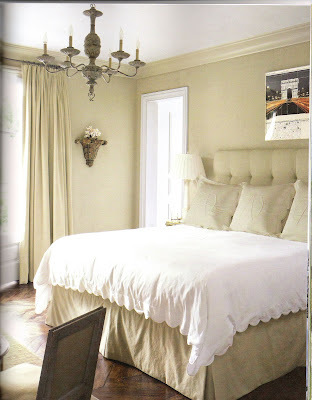 A very soothing, sand colored bedroom with white linens. 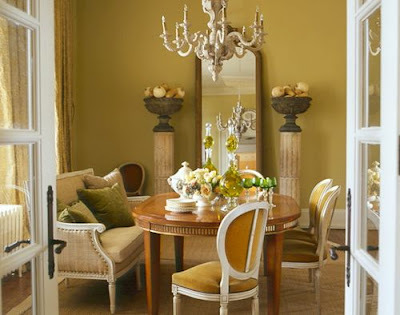 A similar color I like is Benjamin Moore Monroe Bisque. Here are some of my ways approaching paint colors. Use colors that you love and gravitate toward, not just what is trendy. For example, I am just not a blue person usually, so I rarely use it on walls. If I do use blue, it always is on the green end of the spectrum. Some ways of decoding your color likes are magazine pictures, looking at fabrics and noting the colors you are drawn to, looking in your closet, look outside your window at nature and observe what stands out to your eye. A beautiful shade that you love will be a joy to you forever. Don't use a color just because it is the "color du jour". I have been in housing developments where virtually every house has the same paint color. Not good. After you narrow your palette a bit, give some thought as to the amount of depth or saturation of color that you are most comfortable with; do you like soft, more pastel shades or deeper tones? Maybe bright, clear color is more your thing. It's your personal space and color is indeed very personal. A room by Barry Dixon. I have used a similar color called Earthy Ochre by Pittsburgh. Another suggestion I have is to keep your palette in your home fairly small, being careful not to use too many different colors in different rooms. 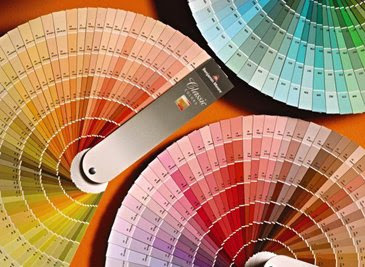 Paint colors are like crayons and it is tempting use a smorgasbord of them, but don't. I find it best to use around three different wall colors and add interest by playing with the depth of these same colors. In other words, use different shades and tones of your palette to change things up a little rather than using a lot of distinctly different colors. That just chops a house up too much. 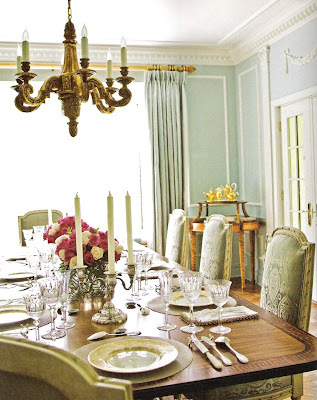 A beautiful dining room designed by Eric Lysdahl. I have used a color reminiscent of this by Benjamin Moore called Palladian Blue. A perfect example of how deep, rich colors don't equal dark and depressing. The use of light fabrics and accessories make the dark walls a perfect backdrop. I absolutely LOVE this room. 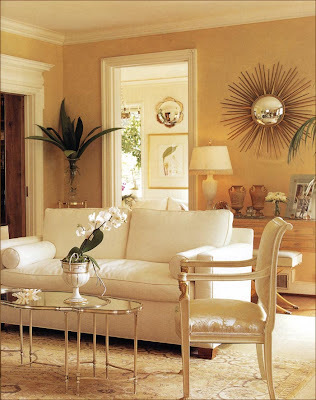 Pairing a rather unusual wall color with elegant rugs and furnishings. This is where a professional can help think outside the color box. Context. The homeowner here may have felt a little worried when this color started going on the walls, but in context of the whole design it is stunning. Trust is important! 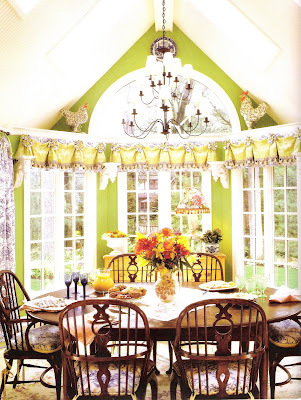 A fresh green breakfast room. Look how the wall color brings the outdoors in. Again, this may have been shocking in the beginning, but with the blue and white toile fabric and traditional furniture, it is not kid-like at all. Q. What if I get tired of it? A. Bad news. You probably will. Hopefully, if we do this right, it will be a long time, but in the end you spend a lot of time in your house and things eventually just feel tired after some time. Good news. Paint is your friend. It is relatively inexpensive and easy to change. Q. I think I can save some money and do the work myself. What do you think? A. Maybe, but probably not a good idea. Painting, like lots of things in the design world, may look easy, but isn't. A good professional painter does this every day. He has the tools and the skills to make your house look like a million bucks. Watching a pro with a good paint brush will almost make you think you're watching Van Gogh. If you can, budget for a professional. Q. I like pastels and shades of white but my friend says this is "so yesterday". What do you think? A. Well, who do you trust, me or your friend? (I have a running joke where I say, "If your mother-in-law or best friend hates it, go for it. It's a hit!") Do what fits you. Forget about everybody else. Q. Can I just keep my "builder"paint for now, decorate everything else, and maybe paint later? A. Theoretically, yes. But do you really want to invest in designing around banality? Paint now, then build from there. Backgrounds should come first. Q. Light colors make a space look bigger, right? A. It depends. 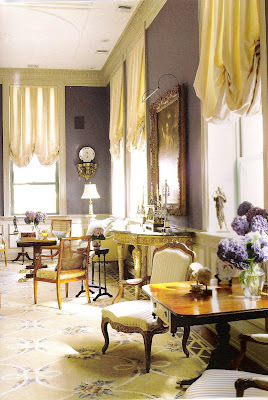 Although it seems counterintuitive, I usually use darker colors in smaller spaces to play up their coziness and lighter or mid-tone colors in larger spaces. If you really want some professional color advice and education, I suggest you go to http://www.colourmehappyblog.blogspot.com/. Maria is a professional color consultant and I find her color wisdom to be dead-on every time. Decorating involves utilizing many tools. Paint is at the top of the list. It is economical and can set the tone for mood and personality. It is pure color and color is the visualization of human emotion. great article! thanks for the shout out!!! Thanks so much for the mention. Such a surprise! Excellent article - and beautiful photos illustrating your points! Thanks for adding to the conversation! * THANK YOU SOOO MUCH!!! I am sitting here, in my study, amongst 100's of magazine tear-outs, my fav design books (w/ "markers"), a multitude of paint samples, a list w/ a variety of textures I'd like, flooring samples, pics of beds n' miscellaneous "antique or old" pieces for "nightstands" in our MBR~~~ ANNND a huge bottle of ASPIRIN!!! (And I THINK my FIRST real "STOP" probably SHOULD be picking the fabric for curtain panels, as I realize it's easier to match PAINT to the FABRIC, than vice-versa (the rest will be creams & whites & a raffia colors)... Eeks! Am TOTALLY redoing our wonderful bedroom (from head to toe EXCEPT for two "SPECIAL lamps" & a new painting), that faces the pool, desert & city (n'lights) below. Am sooo excited~ so thrilled!!! HAVING FUN, but oh my! I'm getting, what, "confused?". N*O*W I TRULY REALIZE why THE PROFESSIONALS don't get Q*U*I*T*E as many headaches~~~ they know WHERE to go & their knowledge of it all is most definitely "PRICELESS"!!! Happy Wednesday & again, MANY THANKS! Off to Joni and Brooke's now! Hi Linda! Thanks for stopping by, reading, and commenting. I'm so glad my article was helpful. I would love to see pictures of your project! Great post have not had a chance to catch Skirted Roundtable on this yet. I am with you on darker for smaller most of the time. And Linda you too are right about choosing the paint after the fabric. It is absolutely about what you like because you live there and you are one whose life will hopefully be dby the mood those color choices evoke. Love this blog Carol. Thanks, Anon, glad you came. Yes,keeping it personal is key, but sometimes easier said than done. We women have a lot of influences to deal with! I love that green wall by the way! It's so fresh and beautiful! Carol, I love the color of your living room. Would you mind sharing what that is? I'm using Intense White throughout a beach home. Do you think it is necessary to add a different trim color like Dove White with it? Right now, the plan is to use Intense White in the Aura Matte for the sheetrock and Aura semi-gloss for the trim and woodwork. Do you think the two different finishes is enough for contrast?